This beautiful 18ct white gold 0.58ct diamond ring from the Vera Wang LOVE Collection is set with a round cut diamond centre stone within a breathtaking knot design, flanked by two bold sapphires. 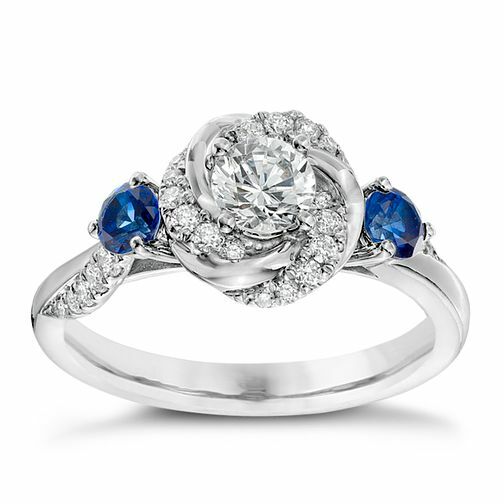 A princess-cut blue sapphire, the signature stone of the collection, sits underneath the head. Vera Wang 18ct White Gold 0.58ct Diamond and Sapphire Ring is rated 5.0 out of 5 by 2. Rated 5 out of 5 by Anonymous from Engagement ring I fell in love with this ring the moment I saw it but had always told my partner I didn't want an expensive engagement ring so was apprehensive about suggesting it. The 0% interest finance plans are fantastic and gave me the engagement ring of my dreams. It looks high quality and sparkles enough for my magpie eyes. Worth every penny. Rated 5 out of 5 by Anonymous from Exquisite piece of jewellery I chose this with my partner as an engagement ring, for a while i have admired Vera Wang's designs but this one stood out from the rest. Although it is described as a 'knot' design, in the flesh it looks much like a rose. As a side profile, the ring almost looks like a crown, such intricate detailing including sapphires beneath the diamond and either side of it. 4 of them in total. I was willing to spend double the cost of this ring but this was the most beautiful ring i've seen, I had to have it!